Emollients are the ingredients in certain moisturizers and cleansers that maintain the skin's softness, smoothness, and elasticity. They are chemicals that remain in the stratum corneum, the outermost layer of the epidermis, and act as lubricants. Emollients are thought to fill in the crevices between corneocytes, or proteins, that are in the process of desquamation, or shedding. They are used to reverse dryness and scaling, fine lines and wrinkles, and irritant contact dermatitis. Emollients are especially useful in managing eczema, psoriasis, and ichthyosis. Dry skin is the result of a lack of water in the stratum corneum. The stratum corneum draws water from deeper layers of the skin, and a very thin layer of sebum and dead skin cells help retain moisture. When the stratum corneum loses moisture it loses elasticity and the skin appears cracked and scaly. There are a number of things that cause dry skin, namely the environment. Dry skin is more common during winter. The air is dry, whether outdoors in the wind and cold temperatures, or indoors in a centrally-heated home or office. The skin loses its ability to produce natural oil and maintain moisture with age, which usually begins around age 50. Certain medications, like diuretics, as well as an under-active thyroid gland and skin conditions like eczema, psoriasis, and ichthyosis all cause dry skin. It's important to maintain proper hygiene, but over-washing can really dry out the skin. The combination of hot water and soap strips the skin of its natural oil. Unless an emollient is applied right after washing, the skin becomes even drier than it should be. Certain laundry detergents can also remove that important layer of oil from the skin. Scaly skin occurs when skin cells detach from the surface of the stratum corneum. This process occurs even in the hydrated skin, but it's unnoticeable; the dryness makes it difficult for the cells to completely detach, resulting in a scaly appearance. In addition to using emollients, there are a few other measures that should be taken to restore the skin. Keep showers short. Hot water might feel good, but warm water is much better for the skin. Use a mild soap or a body wash that has the same pH as skin, like Phisoderm. Moisturizers and emollients contain occlusives and humectants. Occlusives provide a layer of oil to the skin to reduce water loss and help the stratum corneum retain moisture. Humectants increase the amount of water the stratum corneum can hold. Between occlusives and humectants, there is no "better" option. It's solely based on preference. Occlusive emollients are made of oils mixed with water to create a lotion of cream. These include bath oils, lotions, creams, and ointments. Different occlusive emollients are better suited for different parts of the body. For example, a lotion is best used on the scalp, face, torso, arms, and legs. Creams, which are thicker, are better for very dry areas. Ointments are best suited for the driest areas, but they tend to be very greasy. Sorbolene cream is an effective all-around moisturizer that isn't greasy and can be found at the drugstore. Humectant emollients add water to the stratum corneum. Examples include glycerine, urea, and alpha hydroxy acids (AHAs), like lactic and glycolic acid. However, urea and AHAs are slightly acidic and can sting when applied to open and cracked skin. Although emollients are incredibly skin-friendly and hydrating, adverse reactions to them aren't uncommon. The most common reaction to emollients is a burning sensation, which is more common amongst those with atopic dermatitis or rosacea. Emollients that are too occlusive can block hair follicles, resulting in folliculitis or boils. 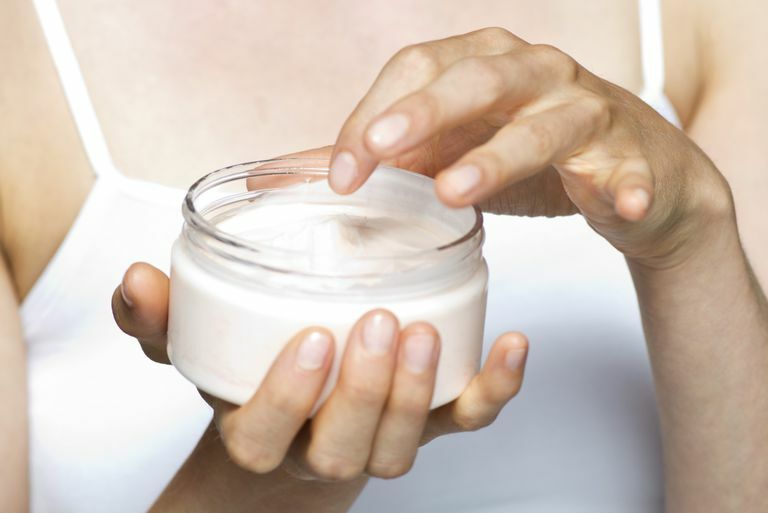 Frequent use of facial moisturizers can exacerbate acne or cause a facial rash.